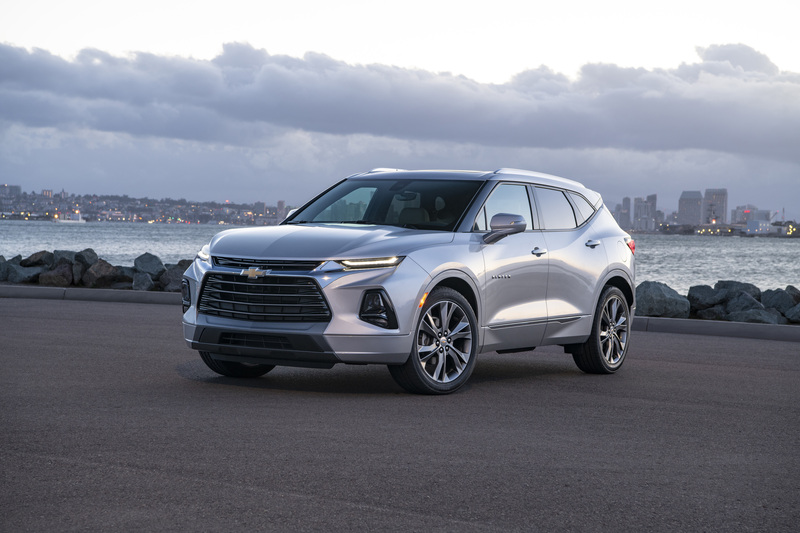 SAN DIEGO – There was a day not long ago when automakers were bending over backwards to figure out how to get a third row into their crossovers and SUVs, but suddenly the hot ticket is two rows with lots of cargo room and the ’19 Chevrolet Blazer is among the latest to march into the segment with, well, guns a-blazing. Tested here in both sporty RS and luxury-leaning Premier trim packages, the Blazer is as fun to drive as its eye-catching design suggests. A 308-hp V-6 mates to a 9-speed automatic transmission for plenty of power and pleasant driveability, while a wide, planted stance combines with all-wheel drive, an optimized suspension and a rear differential with yaw control to make the sizeable CUV feel remarkably light-footed. The Blazer boldly announces its arrival with a large 2-tier grille, which is a blacked-out honeycomb design on RS models and a statelier chromed hash pattern in Premier dress, along with muscular fender flares, a hood as chesty as Charles Atlas and a high, tapering greenhouse recalling sport coupes of two decades ago. The Blazer fits into the Chevy portfolio between the Traverse large CUV and Equinox midsize CUV. It resurrects a name long linked to Chevy pickups and SUVs and arrives at a time when sales are smoking in its segment. In a field occupied by leading competitors such as the Ford Edge and Jeep Grand Cherokee, it is the industry’s second-fastest-growing segment behind compact crossovers and third in volume only to those little CUVs and fullsize pickups. General Motors expects deliveries by the group to grow another 50,000 units by 2020 and another 220,000 by 2025 on the back of rabidly loyal, highly educated and affluent buyers drawn to the segment for exterior styling, bang-for-the-buck and AWD. Unless GM seriously stubs its foot with the Blazer launch – a genuine possibility with the Mexico-sourced truck already a lightning rod for critics of the automaker’s three pending assembly-plant closures in the U.S. and Canada – it will hit dealer lots with wind in its sails as inventories build over the coming months. Mass-market advertising begins April 1. Outside of perhaps the Blazer’s assembly-plant allocation, there are very few items to gripe about. Observed fuel economy over a day of testing hovered around an unimpressive 19 mpg (12.4 L/100 km), but that also was under a heavy foot because the Blazer begs to be driven with enthusiasm. This is not an inexpensive vehicle, either, with top-trim models eclipsing $50,000. But automakers rightly exercise pricing power in this popular segment and choosing an RS or Premier model yields loads of content. It also bears noting that volume modes likely will be the reasonably well-equipped Blazer V-6 with leather, which slots a notch below RS and Premier models and starts at $38,695. However, the RS is the sizzle that sells the steak. Red Hot exterior paint against its black grille and 21-in. gloss-black aluminum wheels from a $2,495 option package makes the crossover stand out shamefully well in traffic. If you’re gonna rob a bank, it would be wise to choose a different getaway car. 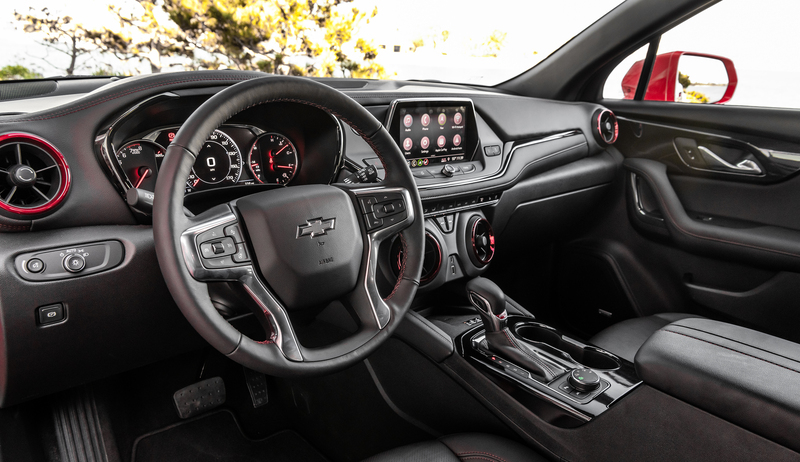 There is a tremendous feeling of roominess inside each Blazer model, but again the RS is on point with a Jet Black interior nuanced with red stitching on leather covering the seats, steering wheel, dashboard, center console and shifter. Overhead glass seems to stretch from the rearview mirror to its integrated roof spoiler, letting the Southern California sun here wash through the cabin. Red light glows from the instrument panel and red circles large HVAC vents copied from the sixth-generation Chevy Camaro sports coupe. A nifty red insert to the shift knob contains a small bowtie, which also is seen in the exterior lighting. Smartly designed piano keys fit under the 8-in. (20-cm) infotainment display for functions such as HVAC, and the texture of the keys changes at the outermost controls for heated seats and cabin temperature for eyes-free use. Another Easter egg of sorts lies beneath the driver and front-passenger armrest, where a tote-size umbrella could be stored out of sight. Chevy also gets its first electronic glovebox for a larger stowage space. Knee areas are well padded, as are the arm rests, although an annoying hard spot will meet passenger elbows against the center console. The seats could use bolstering more in line with the sporty demeanor of the RS. They strike a balance between firmness and comfort, however, and are complemented by a quiet ride. There is ample legroom in the second row, which slides fore and aft. It splits 60-40 and folds completely flat. With the rear seats up, the Blazer’s cargo area easily swallows four sets of golf clubs and an available cargo management system can be adjusted to securely stow items. 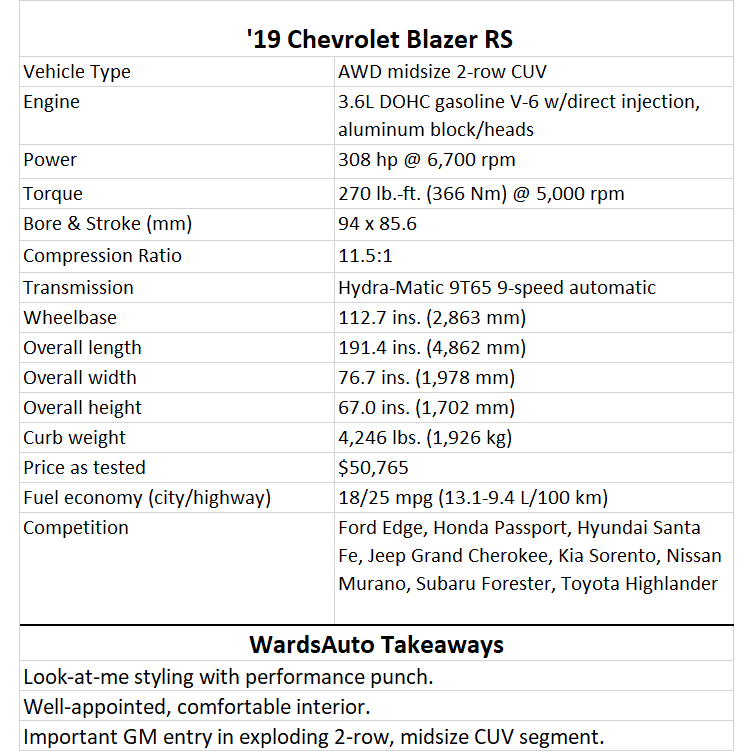 The RS model also is the most likeable of the Blazer lot for its performance upgrades. Already employing high-rate suspension rings and large-diameter stabilizer bars for a firm ride on the pavement and balance in the corners, front struts of the RS receive 40% more compression control and rear shocks have 15% more for better motion control off-road. The RS receives a quicker steering ratio, too. The rack-mounted, belt-driven electric system has a ratio of 15:1, compared with 16:1 on other models including Premier trim. Two AWD systems are offered. Stepping up from standard front-wheel drive is a single-clutch unit, which automatically disconnects from the rear axle when AWD is not necessary to conserve fuel. Jumping into an RS or Premier model offers up a twin-clutch system. It optimizes traction for any road condition but also varies torque distribution from front-to-rear and side-to-side for maximum grip in dry conditions. Traction Select is standard on all AWD models and allows drivers to choose their preferred grip, including 2-wheel and 4-wheel drive for pavement; a sport mode that adds noticeable steering weight and holds transmission gears longer for higher revs; off-road to account for slip; and trailering for pulling up to 4,500 lbs. (2,041 kg) with V-6 models. An available hitch-view feature uses a top-down view projected on the infotainment screen from the rear camera to help drivers line up their trailer without a second person to help, while hitch guidance offers a center line view to help align the hitch. Surround vision with a variety of perspectives also is available. It is part of a pricey $3,375 option package with RS and Premier models, but also pulls in a host of advanced driver-assistance systems and comfort and convenience items such as full-speed adaptive cruise control; wireless smartphone charging; heated rear outboard seats; ventilated driver and passenger seats; power tilt and telescopic steering column adjustment; auto-dimming headlamps; and Chevy’s third-generation infotainment system with Bose audio. While the Blazer shares a platform with several other GM crossovers, it underwent a tremendous amount of design and engineering to give it a unique personality from both a styling perceptive and driving dynamics. It is a sporty, stylish, comfortable and highly connected crossover certain to take advantage of current consumer tastes.